If the dinner conversation at 1600 Pennsylvania Avenue is focused on a Palestinian state and a ‘Middle Eastern peace plan’ built on Israel’s giving away both land and sovereignty, then it’s a pretty safe guess that it is currently year seven or eight of a two-term American presidency. Like clockwork, as the time for him to leave office draws near, President Bush, like Bill Clinton before him, has turned a hopeful eye to the Levant as a solution to his “legacy” problem. This problem is namely the fact that, like his predecessor, the Bush's presidency (short of a miracle solution to the myriad challenges currently facing America) stands to be remembered largely for its poor choices, bad policy, and abysmal public relations, rather than for any large successes in the domestic or foreign policy realms. According to Reuters, Secretary of State Condoleezza Rice “has made clear she will devote all her energy in the Bush administration's final 14 months to get what others have failed to attain in the past – a viable, independent Palestinian state living side by side with a secure Israel.” The fact that the U.S. is currently fighting a war on two fronts in the region – in Iraq and Afghanistan – and is dealing with the growing Iranian and Syrian nuclear threats would suggest that America has higher priorities in the Middle East than treading once more over well-worn ground in Israel and the Palestinian territories. However, the Bush administration, represented by the Department of State and its less-than-competent head, appears more than willing to re-tread this ground, both in an attempt to divert attention (both by those currently watching and by those who will, in the future, write the history of these years) from its as-yet-unsuccessful attempt at nation building in Iraq, and in an attempt to enshrine in its legacy one inarguable foreign-policy success, in an area that has seen only failure on the part of the President’s predecessors. To this end, a “Palestinian statehood conference” will be held at the end of November in Maryland. 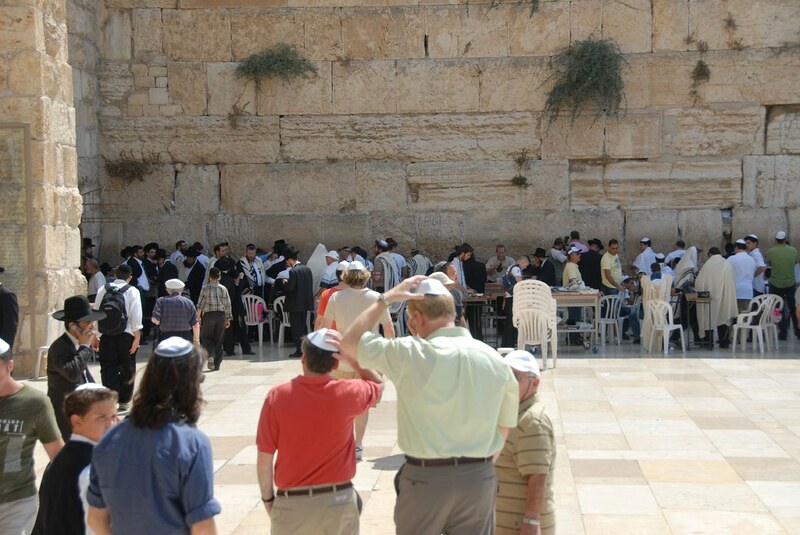 The "wailing wall" -- the western wall of the old Hebrew temple in Jerusalem. In the foreground are Jim of the blog Gateway Pundit (center) and Scott Johnson of the blog Power Line (left in red shirt). In its attempt to change the focus of American foreign policy from the War on Terror and Middle Eastern nation building to the obligatory attempt at legacy-building through pressuring Israel to make land and defense concessions, though, the Bush administration is making several mistakes. The first is allowing the Palestinian and Arab representatives a seat at the negotiating table (and thereby conferring legitimacy upon their positions in the exchange) without setting the recognition of the Zionist state’s right to exist as a precondition. Stipulating that Israel has a right to survival must be a requirement for beginning any 'peace process,' rather than being used as a point of negotiation by the Palestinian representatives. The second mistake is following the lead set by previous administrations and negotiators, who have set the precedent of unilateral concessions by Israel as a starting point for these negotiations. Among the massive concessions the administration is asking Israel to make this time in the name of “peace” is the transference of sovereignty over Arab neighborhoods in Jerusalem to the Palestinians and the surrendering of Israeli sovereignty over the sacred Temple Mount in that city. Also, huge chunks of neighboring Judea and Samaria would be surrendered should the Bush-Rice plan be agreed to, something which would immediately make the over 100,000 Israelis living in those areas into refugees themselves, and which would eliminate the crucial buffer that protects the narrow Jewish state from Palestinian rocket and other indirect fire attack. Further, according to the administration and their willing accomplice, Israeli Prime Minister Ehud Olmert (who holds a staggering 9% approval rating for just this reason), an agreement regarding the so-called Palestinian “right of return” (the right of Palestinians to re-populate the areas they left or were driven from during the 1948 war for Israeli independence) would be discussed, as well. Every one of these concessions is unacceptable for reasons of security and sovereignty at the very least. 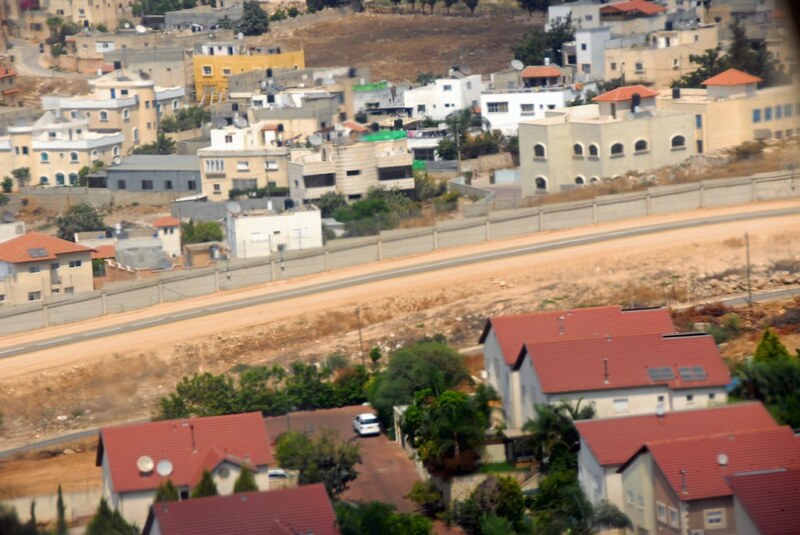 The West Bank (top) and Israel (bottom), with the notorious "wall" (which is, in most cases, nothing of the sort, instead being a wire fence with motion sensors strategically placed along its length to detect potential breachers) between the two. The proximity of the Palestinian settlements to Israel itself (especially one of its two major highways) is stunning. If Judea and Samaria are abandoned by Israeli Defense Forces Israel and the West Bank is used to make an autonomous Palestinian state, then the launching point for attacks on Israel will be moved to a position literally right next door. The third mistake lies in Rice and Bush’s assumption that the Palestinians and their leaders, as well as the surrounding nations, actually desire peace with Israel in the first place, despite the fact that history seems to clearly show otherwise. Since the last Israeli-Palestinian cease-fire was agreed to last November, inhabitants of the Gaza Strip south of Israel have launched nearly 400 homemade Qassam rockets (fashioned from water pipes – no wonder Gaza has no infrastructure – and rebar, and filled with nails and ball bearings) at the Israeli town of Sderot, as well as at the Israeli plant which provides Gaza with its power. Though Rice has publicly stated her belief that the Palestinian people hold the same values that Americans do, and desire peaceful, prosperous lives just as much, a brief look at Palestinian state television clearly demonstrates just how different the Palestinians’ view of “quality of life” is from Americans’ and Israelis’. The glorification of suicide bombing (or “martyrs”), the question of “how many Jews did your father kill?” to the children of suicide bombers, and the veneration murdering Israelis as the ultimate goal to strive for in life – all on children’s programming – is standard fare on both Hamas and Fatah-funded state television. The Mouse "Farfur" discusses with a Palestinian child the need to kill all Jews. From Palestinian state television. (Under threat of a lawsuit from Disney, the show's creators had Farfur murdered by Jews and replaced by a Jihadi bumblebee). Perhaps the biggest mistake being made by Secretary Rice and the rest of the Bush administration in their quest for a legacy, though, lies in their choices of whom to consult about how best to move forward on this matter. In the last week, Rice has sought advice from two notorious critics of the administration, former Presidents Jimmy Carter and Bill Clinton, on the recipe for a successful peace in the Middle East. While the decision to speak with the former Presidents might not have been the worst one, especially if seeking knowledge of what not to do, the timing is singularly poor. Carter has in recent years become a more and more vocal opponent of Israel’s sovereignty, most notably with his terrorist-supporting call to “give Hamas a chance” in control of the Palestinian government (after he certified their electoral victory in January 2006) and with his book “Palestine: Peace not Apartheid,” in which he hyperbolically accused the Jewish state of waging a war on the human rights of those who attack Israel on a daily basis. Regardless of what position he might have held in the past with regard to the Israeli-Palestinian conflict, it is clear that Carter is neither an unprejudiced observer nor a sound source of advice on a plan for peace which does not give our best ally in the region short shrift. Jimmy Carter gives an enthusiastic thumbs-up to Hamas's election to Palestinian leadership in January, 2006. Carter certified the election, and asked the world to "give Hamas [a terrorist organization] a chance," arguing that if the world didn't treat them as terrorists, then they might not act like terrorists. Seeking advice from Clinton was a poor choice for different reasons. First, Clinton’s attempt at brokering a Middle East peace deal, was, like Bush’s, a last-ditch, late-term attempt at salvaging his tarnished presidential legacy by scoring a seemingly impossible foreign policy success (so there is common ground on that front). However, Clinton was ultimately unsuccessful in his peace efforts; in fact, it was during Clinton’s last few months in office that the second intifada broke out, sparking several more years of violence. The biggest reason why it was a mistake for the Bush administration to seek the advice of President Clinton, though, has to do with timing. At a time when Clinton’s wife, Hillary, is the frontrunner for the Democrat presidential nomination, the appearance of approaching the former president for counsel confers upon him – and, by extension, his wife the candidate – an aura of wisdom and of foreign policy expertise. Rice's move here simply reinforces the impression that this administration, already thought by many to be inept in matters of foreign policy and diplomacy, requires the assistance of the wise and effective Clintons to do anything right outside the borders of the U.S. 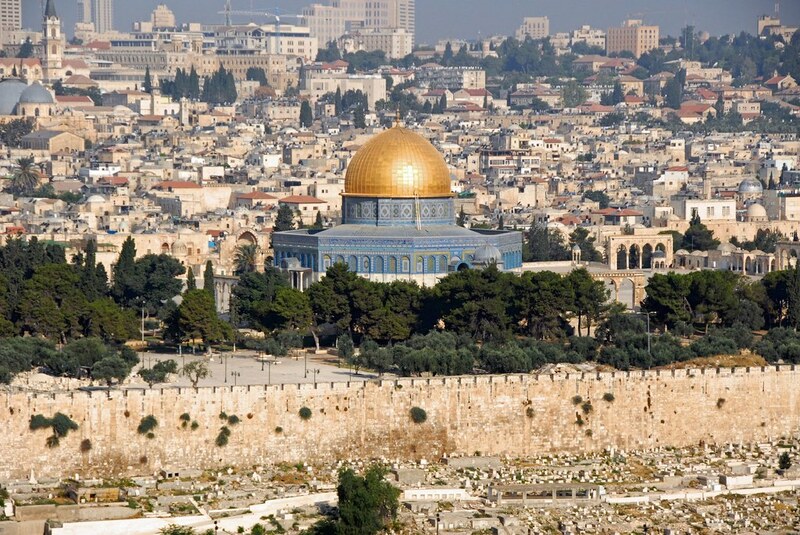 The golden dome of the al Aqsa mosque dominates the skyline of old Jerusalem and occupies the temple mount, sitting on the foundations of the old Hebrew temple. The temple mount is within Israeli territory, but the Muslim holy site is maintained by adherents to the latter faith, not by Israelis, most of whom are not allowed nearer the mount than the western wall. The Israeli-Palestinian conflict cannot be ‘solved’ in the mere fourteen months that President Bush has remaining in office – especially not through unilateral Israeli concession, many of the details of which almost exactly mirror the concessions that former Prime Minister Ehud Barak agreed to, and PLO leader Yasser Arafat walked away from, under Clinton. The fact that the Bush administration is going down this well-traveled path in the last months of its tenure clearly demonstrates that clichéd attempts at legacy-saving are more important to the President and his Secretaries than are meaningful policies. Further, the fact that Bush and Rice are going about doing this in exactly the same failed manner that their predecessors Clinton and Albright did only seven years ago shows that the decision-makers in the administration have maintained for the duration of their time in office the same lack of historical and practical understanding that led them into the foreign and domestic policy blunders that they have made thus far. Jeff Emanuel, a special operations veteran of Operation Iraqi Freedom, is a columnist, a combat journalist, and a director of conservative weblog RedState.com.